Boy Scout Troop 50 | Chattahoochee Council | Auburn, Ala. | #troop50: Great start to a new day. Great start to a new day. After a hot and humid day yesterday, Thursday dawned bright, clear and beautiful. 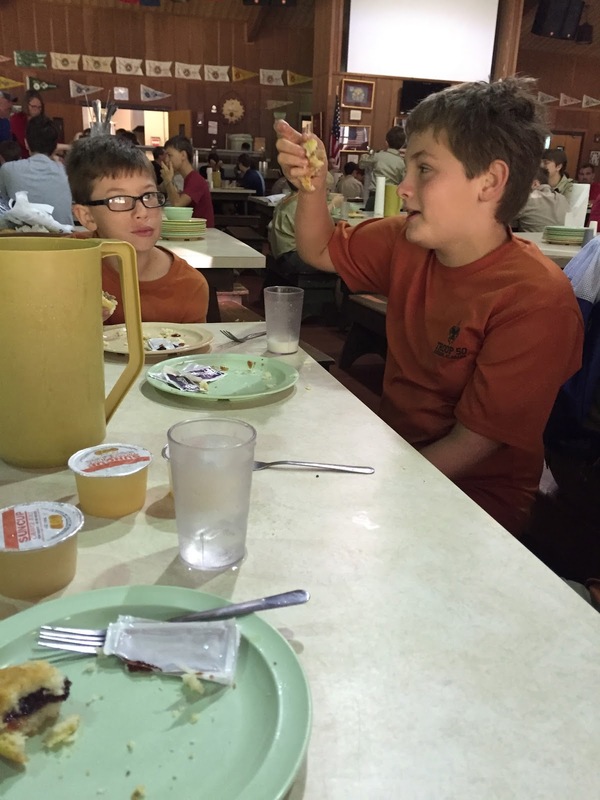 Although some of the Scouts felt that a few hours more sleep may have been just what they needed, everyone was up and out for breakfast at 7:00 am. 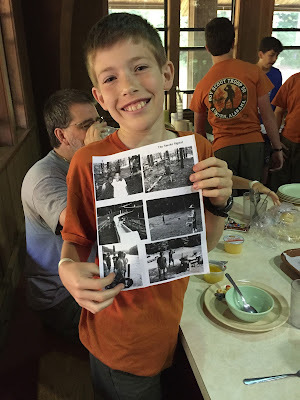 The big news for the morning was that Carl made the photo array in our local camp newsletter The Smoke Signal (delivered each morning at breakfast). The photo showed him on the pier during a swimming merit badge class. We have decided to further his fame by tacking the paper up on our troop bulletin board. bottom corner of the newsletter. The other interesting surprise at this morning's breakfast was the selection of biscuits, eggs, and what appeared to be chicken patties. Zach loaded up on chicken biscuits, talking about how great the chicken tasted. He had consumed three biscuits (and was ready to head to the kitchen to replenish the platter), when it was pointed out that it wasn't chicken but country fried steak instead. He shrugged his shoulders and said it was just as good before heading back for more. I guess that it proves the point that everything does taste like chicken. Zach expounds upon the virtues of the "chicken" biscuit. The boys are now out at their merit badge classes or the Eagle Bound program, leaving the adult leaders some time to relax. Although, Mr. Williams seems to have sparked a woggle-making competition among the adults that has almost reached a mania. Hopefully, that will pass without requiring legal or medical intervention. More fun awaits in the afternoon!